So I’ve been dragged along by the girls that I work with to our work Christmas party. I’m at a loss on what to wear. I work at a high school so the people that I work with now are a lot different to my previous jobs (fast food, waitress, etc.) where I would dress very casual. We are going out to dinner and a few drinks after so I do want to look nice. Btw it is well into summer over here. Help a girl out and drop a few pics please! 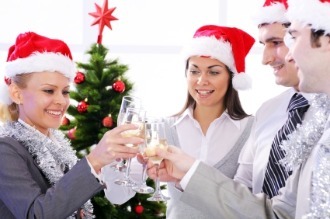 Successful business group celebrating the success of a glass of champagne on New Year’s holidays. What are you comfortable with showing? (Chest… Etc) How about a really cute lace low cut top with maybe even an open back and a pair of black booty shorts!